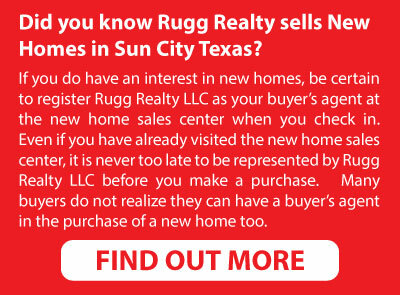 Rugg Realty LLC has the very best grades in customer satisfaction of any broker located in Sun City Texas. the "Vendor Book" located at the monitor station in the Community Association building just out side the ballroom, is filled with testimonials and recommendations from clients who are thrilled with our service. Check out the book for yourself and see why we have been the fastest growing broker in Sun city Texas for the past four years. We are a new (to us) home owner in Sun City thanks to Agent Pam Dees and Rugg Realty. Pam was so patient throughout our search and found us the perfect home. She was attentive to our wishes: a green belt at the back yard and a covered patio to enjoy it, away from a busy street, an extended garage, … and she graciously presented her opinion when we asked. It was a great experience working with Pam. If we need a RE agent in the future we will definitely call Pam. We weren't even sure we were going to buy in Sun City, but we spent 3 different days looking at houses and what all Sun City has to offer with our realtor, Jeanne Cours, and we knew it was the place for us. Jeanne's personal knowledge of Sun City was great. She knows the place inside and out! We worked with Jeanne for 3 months before we finally put a contract the house we now call home! Jeanne was right there all the way, taking care of our needs and answering questions. Being 3 hours away from Sun City while we were under contract was so much easier with Jeanne than with any other realtor we've ever worked with. And to put that into perspective, this was our 9th home to purchase in the past 30 years! 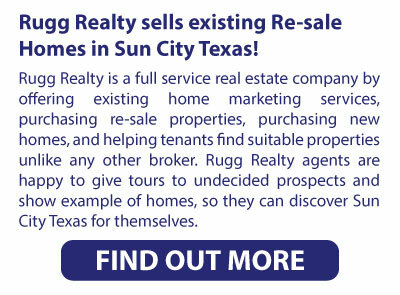 I highly recommend Rugg Realty if you're shopping in Sun City and definitely ask for Jeanne Cours! Am excited to have a lease on a beautiful home in Sun City. Brian efficiently orchestrated the entire process. I had many questions and he quick to respond with answers. He worked on Saturday and Sunday to meet our schedule. I would highly recommend Rugg Realty and will use them in the future. 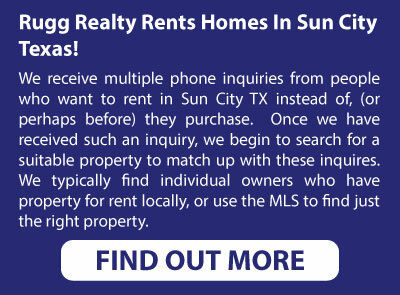 Brian Rugg helped us find a home in Sun City, Georgetown. We do not live in the area and he was always willing to meet us to show us properties. After we found and purchased our home he helped us lease it until we are ready to move. We started looking in Sun City on a Thursday; Pam Dees showed us 20+ homes in our spec range; by the following Friday we signed a contract for the exact home we wanted. Pam was wonderful through the whole process - up to and including present time. She's knowledgeable, connected, attentive to detail and a joy to work with. She also worked with another member of our family and everyone recommends her to anyone looking in Sun City. Brian Rugg was our realtor and helped us find a home to purchase. We do not live in the area and he was very accommodating to meet us when we could come to look at homes. He made the purchase of or home a pleasant experience. After the purchase he assisted in leasing the home. Again, everything is professional and a pleasant experience. I would highly recommend this company. Yesterday my husband and I met with Brian Rugg to discuss the possibility of selling our home. He met all of our expectations and then some. We needed his help to make a very big decision. His approach is very balanced as he presented both the positive and possible negatives involved with our decisions. We give him the strongest recommendation. We were impressed with Jeanne Brown even before we met her in Georgetown. She responded quickly to our introductory email, then arranged to be present while we met with the Sun City sales person to discuss the possibilities of building. The following day Jeanne took us to the numerous existing homes we had on our list and added a few others she thought might meet our needs. In a whirlwind couple of days she arranged with the homeowner for us to come back 2 more times, walked us through the ins and outs of the offer, and was an able negotiator. We would recommend Jeanne to anyone seeking to buy or sell a house in the Georgetown area. She is a knowledgeable and able realtor as well as fun to be with. We are a new (to us) home owner in Sun City thanks to Agent Pam Dees and Rugg Realty. Pam was so patient throughout our search and found us the perfect home. She was attentive to our wishes: a green belt at the back yard and a covered patio to enjoy it, away from a busy street, an extended garage, … and she graciously presented her opinion when we asked. It was a great experience working with Pam. We would definitely call her again if we needed a RE agent. Sun City Not for You?